Vatican City is an important site in the history of Christianity that is also known for its Renaissance and Baroque artistic creations. 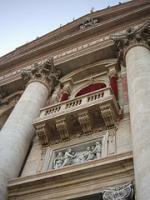 Most famous monument within this small city state is of course the San Pietro Basilica. Until 1989 this was the biggest cathedral in Christianity (now it is surpassed by his replica in Yamoussoukro, Ivory Coast). The current structure dates from the early 16th century, although there have been churches on this site since 326 AD. The Sistine Chapel is the other remarkable item here. Dating from the late 15th century, this papal conference room is decorated by a series of paintings by a.o. Michelangelo. Between 1535 and 1541 he added his masterpiece: The Last Judgement. After restauration in the 1980s, visitors can enjoy again the marvellous glow of his art. Vatican City is a nice day trip from Rome. Nothing more or less. You could skip it when you only have a few days in Rome, in favour of the monuments of the Classical Roman Empire. 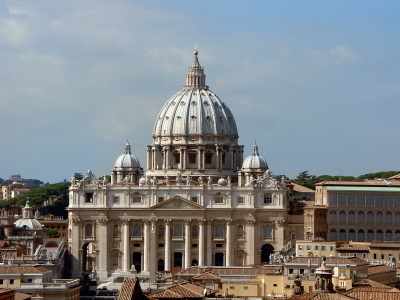 San Pietro Basilica is large, extremely large. That is the only impression that really lasted after I visited the site. Vatican City is an architectural wonder, a theocracy, a rich repository of art and literature, and the center of the Catholic church; there is a lot packed into the world's smallest nation-state. St. Peter's Basilica is the largest church in the world, and the interior is resplendent in marble and gold trim. The dome is impressive to see from inside the basilica, but I enjoyed the view even more from the tour I took to the top of the dome when I first visited over ten years ago. From the dome you can survey Bernini's masterful design of Saint Peter's Square, as well as the exquisite architecture of Rome spreading over its fabled hills. Nearby is the Vatican Museum with the Sistine Chapel and the wonderful Gallery of Maps, which was as magnificent as I'd heard. I highly recommend a visit to Vatican City on a Wednesday morning, when the pope gives an address to the masses assembled in the square, which are an impressive mixture of clergy, members of religious institutes, and visitors from all over the world. I've heard two different popes speak during my visits, and I'd submit this is about as quintessential a Vatican experience as you can find. Logistics: Vatican City is an easy walk from downtown Rome, but it can also be reached by the Ottaviano metro station or by the Roma San Pietro railway station. In November 2013, we spent five days in Rome and we scheduled one day for a re-visit of the Vatican City, namely the St. Peter's Basilica and the Vatican Museums. Both sites are crowded with tourists throughout the year, thus I would recommend to purchase the ticket for the museums online and to visit St. Peter's Basilica either early in the morning or in the evening shortly before closing time. 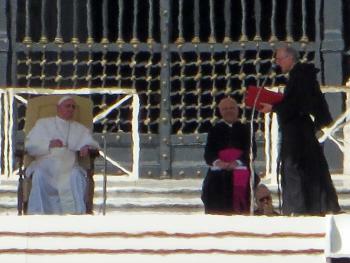 We arrived at St. Peter's Square at quarter to seven. Before entering the basilica you have to pass a security check, similar to the check at an airport. But there are no queues early in the morning, there were only about 20 other people. 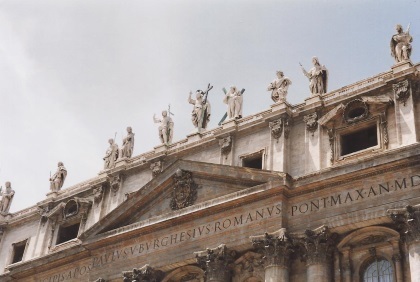 St. Peter's impresses by its size, the huge dome, the interior decoration, and its famous artworks, it is the centre of Christianity and therefore it should not be missed. But to be honest, I am not very excited about the basilica, there are a lot of cathedrals on the WH list, that impressed me much more. The access to the apse is restricted to guided groups, but we were lucky, the security guard thought that we belong to a group of German tourists, and we were allowed to pass through the barrier. So we could take a closer look at Bernini's baldacchino and the Cathedra Petri. But my favourite work of art in St. Peter's is the Pietá by Michelangelo. 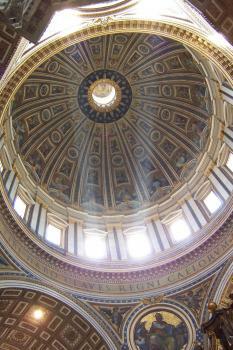 The highlight of our visit to St. Peter's was the dome. It opens at 8 a.m., the entrance fee is 5 euro for 550 steps on foot (two euro more if you take the elevator up to the terrace, but then there are still 320 steps to walk). The staircase is very narrow in some parts, particularly the section that runs between the two dome walls, but it provides interesting insights into the static construction. And the efforts to climb the 550 steps are rewarded by the wonderful panoramic view of St Peter's Square and the Vatican Gardens. The photo shows the Vatican Museums with the Sistine Chapel in the foreground. After we left St. Peter's Basilica, we had still time for an espresso before we had to meet our time-slot for the Vatican Museums at 11 a.m. It was very convenient to book the tickets online, we could go past the long queues and it took only a few minutes to swap our voucher for the real tickets. Be aware that the museums are always full of tourists, but do not let this deter you, a visit is worthwhile. My recommendations for a relaxing visit: take your time, find your own pace, wait for gaps between the guided groups, then you will be able to properly view everything of interest and also to take nice photos. My highlights were the statues in the Cortile Ottagono (eg the famous Laocoon group), the Gallery of Maps (where I probably spent most of the time) and the magnificent paintings in the Raphael Rooms. Of course, every visitor also goes to the Sistine Chapel, I was there twice, but both times I was rather disappointed. It is a odd experience. You stand there crowded together with hundreds of other visitors, looking at the ceiling at these famous frescoes, such as The Creation of Adam, and every twenty seconds, the penetrating voice of a security guard yells "no photos" and "silence please", quite strange, because this is by far the loudest noise in the chapel. The Sistine chapel is the only part of the museums, where it is not allowed to take photos, probably because it is a chapel, but certainly nobody gets religious or spiritual feelings. The paintings are difficult to see in detail, because the ceiling is very high, the best would be to use a pair of binoculars. One day is enough to visit the smallest country in the world, but if you have less time, I would skip St Peter's Basilica in favour of the Vatican Museums. I visited this WHS several times. However, the highlight of all my visits was listening to the Pope's Urbi et Orbi blessing on Christmas Day from St. Peter's Square. One of the coolest things that a tourist can do is to see an entire foreign country…All of it…From one end of the other. This is activity that can literally take a lifetime in some cases, and for most of us, that’s just too damn long. So how to choose? The Knights of Malta’s embassy at Via dei Condotti 68, has official extraterritoriality, which means that, it’s the territory, not of Italy, but of the Knights, which don’t have a country back home like Belize or Monaco and thus, the small palace and it’s courtyard are the whole shebang. They don’t let tourists in, and there’s nothing to actually see except a couple of trees and boring office space. So that’s why the Vatican’s a must. It’s an official country, and at 0.2 square miles, much of which is dedicated to one of the best museums in the world, is doable, and thanks to the internet, now more than ever. It used to be that getting a ticket to the garden tour, where you get to hike all the way to the helicopter pad on the western end of the country and back, was impossible. You had to send a fax to some monsignor somewhere, and wait a few weeks, and if the pope decided to take a jog or something, it could be cancelled. Then you’d be stuck. But today, it’s different and it’s worth the trouble. The first thing you notice when you get off at the Ottaviano metro station is that the reason the Vatican still exists is that it’s surrounded by a very high and thick wall. Across the street are literally hundreds of souvenir shops, at least on the side close to St. Peter’s basilica, and these sell religious articles and pope stuff, and it’s best to ignore these for now. So look for the huge line and find where it begins. You don’t need to wait because you’ve already got a ticket. You enter the museum entrance and go through customs, which resembles airport security. You will then notices the first of many official souvenir shops, which dot the museum. After presenting you’re ticket to the people at the guided tour they give you a little radio receiver. That way the guide doesn’t have to yell and disturb the priests who hang out in the gardens to shirk their hard spiritual labors. What’s there is almost unexpected. Aside from the formal gardens, there’s areas of lush subtropical splendor palm trees and banana bushes with parrots screeching from here and there. There’s Pope Pius IV’s pleasure dome, which dates from the early 16th century, which is a sight to behold, a small temple to the Madonna and John Paul II’s jubilee bell from ten years ago. The priests and Swiss guards don’t like tourists mucking up their private park, and after about two hours of hiking, we’re sent back to the grounds of the museum and relieved of our radios. The tour covers about 75% of the country, and the rest is the museum and the office buildings. While the offices are of no real interest to anybody who doesn’t have business there, the museums are. The Popes didn’t live in the Vatican until 1870. That’s because they controlled all of central Italy until then, and would only use it as glorified panic room when the Romans would revolt, or the Saracens or Germans for French would invade or something like that, and since these things would happen far more frequently than one might assume, what is now the museum was a rather large palace. This palace now contains literally centuries of plunder and collections, Rome being almost three thousand years old and all, every time someone found a sculpture, his holiness would get first dibs on it, and if he was generous would actually pay for it. The amount of ancient Roman sculpture on display is mind boggling there are tens of thousands of busts of anyone and everyone between emperors and slaves, some of which are rather famous, such as Laocoön and his Sons by Agesander, Athenodoros, and Polydorus, and the iconic image of the Emperor Augustus. But the Sistine Chapel beckons, and while the art is spectacular, the place is as crowded as a subway car during rush hour, and the conservators keep the room dark, and it’s difficult to take it in. Then once you’re finished with that, there’s the long trek back to the exit, and on the way, there’s dozens of official souvenir stands selling Michaelangelo reproductions and Pope stuff. There’s also a pizzaria, which isn’t bad. Then you have to leave the country, return to Italy, and follow the walls to St. Peter’s basilica, which is a trip in itself. There’s the huge works of art, and at least three dead popes in glass cases (John XXIII, Clement XI, and Pius X) and a souvenir shops in the treasury area and near the statue of Constantine. The huge church is in fact built over a graveyard, and you can see that too, but aside from the graves of the two John Pauls, it’s difficult to find any of the more interesting ones. The area around the entrance to the basilica has a dozen or so official Tchotchke places, so it qualifies as a tourist trap. It is essential. Truly amazing, I happened to go to The Vatican City by chance, was truly amazed to read about the size & population of this country. St Peters was extraordinary and arguably as impressive as any architectural feat in Christiandom. Even more special was a tour of the Vatican Museums and the Sistine Chapel. The Renaissance paintings and rooms were breathtaking despite the crowds. Most impressive was a 15th century hand painted translation of Aristotle's 'Poetics'. However, the Museums have an enormous collection of artifacts from Antiquity onwards. This is the world’s smallest country, however it possesses a wealth of history, art & architectural treasures worthy of even the largest. The creation of the Vatican as it is at the moment mostly goes back to the High Renaissance when many of the commissions were taken up by nothing short of men of genius (Bramante, Raphael, Michelangelo and Bernini), a much over used term but here it can be pretty justified. The central part of the site is St Peters Basilica, it is one of the holiest places in Christendom, destination of one of its three main pilgrimages and is one of its largest cathedrals. I was very impressed, it is massive inside and finely decorated, the dome is huge. Underneath the Basilica sits the crypts with the remains of the popes from St Peter through to John Paul II. 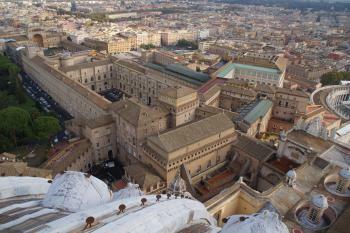 The other main part open to visitors is the Vatican museums. These are very busy and normally have long queues, but I think they are defiantly worth he hassle to get inside. The exhibits are fine but the main draw is the rooms themselves with their immaculate decorations. I really enjoyed the geographical room, and of course the Sistine Chapel, which comes at the end of nearly all the routes. The chapel is one of the highlights of Rome, and impressive despite the huge amount of visitors. However my favourite single piece of work was Raphael’s ‘School of Athens’ covering a wall in one of the many rooms he decorated. Ken Clarke in his documentary ‘Civilisation’ (it is a little old but a truly awesome piece of work, well worth buying on DVD) described this work as “a summit of western civilisation” I find it very hard to disagree, this was the highlight of Italy for me. No matter what your religious or political views (mine clash with this site a fair bit) this is a site well worth visiting, allow yourself as long as it takes from Rome (depending on queues at least half a day). This site is about as good as WHS come. I'm not Catholic, but it is hard to not be impressed by the lavish wealth and imposing structures amassed by the church and on display. It really is quite a show. Very few World Heritage Sites can claim to take up an entire country (only this one, really), and the Vatican City is an unusual country, to say the very least. You should go there just out of curiosity, even if you are not interested in anything else. The world´s smallest and least populated country, but one that issues its own coins and stamps, has a mercenary army of medieval Guardsmen, a border that is just a line drawn on the ground, and lots of other oddities in this last absolute monarchy in Europe (actually, a theocracy). Apart from all this, two top attractions await visitors: St.Peter´s Cathedral is an immensely big church with many side attractions (St.Peter´s Tomb, star marking the spot where Charlemagne was crowned Emperor in 800, the Pietà) and is usually very crowded (together with the no less magnificent St.Peter´s Square with its colonnades), especially on or around major church holidays. Probably the (even) better attraction is the Vatican Museums, an ensemble of museums, expositions, and collections that could take days to explore. Plus it contains a wonderful highlight - the Sistine Chapel, one of the world´s major masterpieces of art, in which papal elections still take place today. For this room alone, it´s certainly worth to stand in line for a couple of hours to get in. Often overlooked or bypassed, the Castel Sant´Angelo also merits a visit - very fascinating interior! Even if you are not Christian or not a believer, you can´t fail to be impressed by these monuments. Designed by Pirro Ligorio: Exedra in the Cortile del Belvedere, Casino di Pio IV. Famous suicides: Alessandro Benedetti, a young Italian cadet officer of the elite Vatican police force, died of a gunshot wound inflicted by himself in 2007 in the Gendarmes barracks. Assassinations: Numerous famous assassinations (real of suspected), the last one being on May 4 1998, when the head of the Swiss Guard, Alois Estermann, his wife and a vice-corporal, Cedric Tornay, have been found dead killed by shotgun. The circumstances of this killing are still subjected to many speculations. Astronomy and Astrology: The Vatican Observatory is one of the oldest astronomical institutes in the world. In fact, three early observatories were founded by the Papacy: the Observatory of the Roman College (1774-1878), the Observatory of the Capitol (1827-1870), and the Specula Vaticana (1789-1821). Helen of Constantinople: Her sarcophagus is in the Museo Pio-Clementino in the Sala a Croce Greca. Attila the Hun: A fresco of "The meeting of Leo the Great and Attila" by Raphael 1514 is situated in the Stanze di Raffaello. It portrays the meeting which took place, it is thought, on the banks of the Mincio near Mantua in 452AD where, after devastating much of N Italy, Attila met an embassy including Pope Leo I in person. After the meeting Attila turned back to the Danube for reasons not entirely clear. That winter Attila died and the divine intervention of SS Peter + Paul was assigned to the meeting thus significantly bolstering the Papacy in general and Leo "the Great" in particular. The fresco actually portrays the face of Leo X, Pope at the time of Raphael! Religious Relics: St Peters eg Part of the "True Cross"
Eastern Catholic Churches: St. Stephen of the Abyssinians is Ethiopian Catholic. 698 Community Members have visited.